Ina bid to set up some fight in the tablet category with world renowned manufacturer Apple, Dell has unlashed the planet’s slimmest tablet under the name of Venue 8 7000.this revolutionary gadget sports an 8.4″ QHD screen glass and Intel’s home-baked Real Sense 3D camera. The Venue 8 7000 features a large 8.4″ OLED display which expands nearly edge-to-edge on either sides, hence making the Venue 8 more squashed in contrast to Apple’s iPad mini. The OLED display gives users superb viewing angles and eye-catching color contrast. The tablet is merely 6mm, almost 0.1mm thinner than the iPad Air 2. Under the hood of this tablet, users can find a robust and impressive 2.3GHz quad-core Intel Atom Z3500 chipset along the provision of 2 GB RAM and built in memory space of 16 GB, which can be integrated up to 512 GB via microSD clot. The major alluring attribute of this high-profile tablet is the Intel RealSense 3D shooting sensor placed at its rear. The 8 MP back camera is supported by 2 more cameras which deliver intense and post-processing freedom. Prior to capturing images, users can refocus, change backgrounds and even edit background objects. This RealSense 3D tech was specifically aimed for notebooks but this tablet is the first of its kind to hold this out-of-the-box feature. The Venue 8 7000 is operated with Android 4.4 KitKat, which can be also upgraded to Lollipop, the latest OS of the Android portfolio. 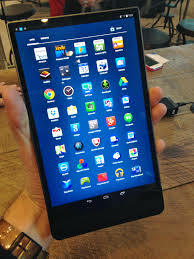 The tablet can also connect to LTE technology. So far, kick off price tag for this innovative tablet will be $400 (PKR 40,000), nearly identical to the iPad mini 3 and the genuine iPad Air. This incredible device is surely going to give a flying start to Dell in the tablet category due to its quite exquisite features. It is sure to draw attentions of users all over the globe.